King Toronto Condos Toronto is a project in its preconstruction stages which is sure to inspire envy once it is completed. 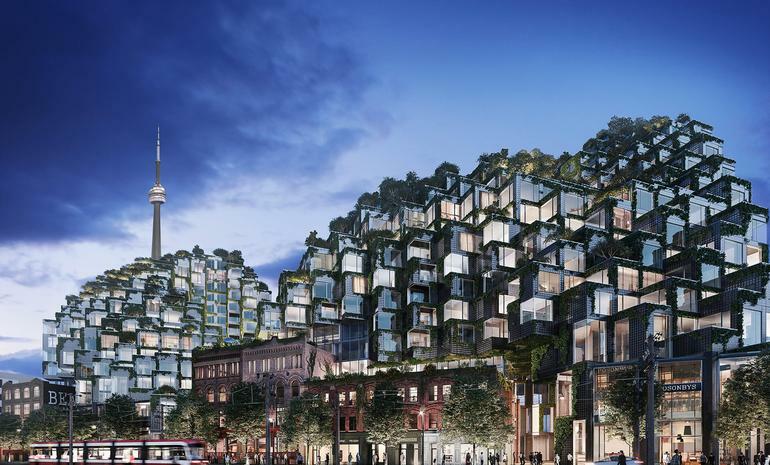 The project is developed by the renowned developers Westbank and Allied Properties and the project is being designed by BIG - Bjarke Ingels Group and Diamond + Schmitt Architects Inc. 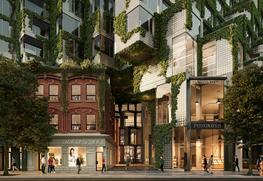 Both these names are linked with some of the most prestigious residential and commercial projects in Canada and the US. The residential condo is situated on 533 King Street West, Toronto and the project will enjoy a vast number of amenities because of its strategic location. The project is being envisaged in a spectacular glass design with floors rising up in a step like fashion that makes it all the more exciting to look at. 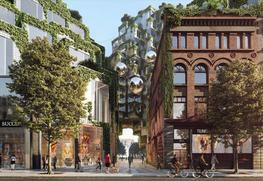 The project will be 16 storeys high and will have 514 units. The project King Toronto 1BHK suites will start from sizes of about 390 sq feet and will go up to about 472 sq feet. The sizes of the suites can go up to 2786 sq feet. The project will also have greenscaped terraces and the upper floors and the terrace will provide spectacular views of the surrounding city skyline. The King Toronto Condos amenities are many and diverse and this is what makes the project so desirable to the potential residents who have already started enquiring after the project. The project will feature a spectacular swimming pool as well as a spa. There is a also going to be a Hot Tub and the youngsters can relax in the games room. A fully equipped fitness center is also available for the fitness enthusiasts. The project also has a party room for get togethers and there is also a parkade for light vehicles. The project has a wonderful lounge on entry and the project will also have some additional storage space that the residents may make use of. The project is situated in a locality which is bike friendly. Additionally, it has a walk score of 96 and a transit score of 100, as it is one of the most well connected areas in the city. Almost all items of daily need can be found just round the corner and markets and hospitals are located very close by. The Trinity Bellwoods Park is a great place for the family to enjoy and the Fort York National Historical Site is also located a few minutes’ walk away. Residents can head to the Yonge- Dundas Square for all items of daily need. The St. George Campus of University of Toronto will be easily accessible from here, making it a easier for the students to commute to college. Westbank and Allied Properties is a well known name in the industry that has over the years, done much to enhance the cities of Canada by gifting the communities one great project after another. It has teamed up with equally renowned designers and they have always stressed on providing visually aesthetic properties which will one day become heritage sites by themselves. They lay a great deal of stress on the outdoor environment of the properties and there projects never lack in greenery even though they are situated in the heart of the city. 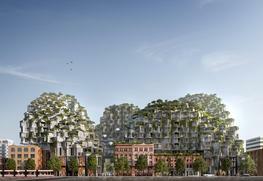 BIG - Bjarke Ingels Group and Diamond + Schmitt Architects Inc.